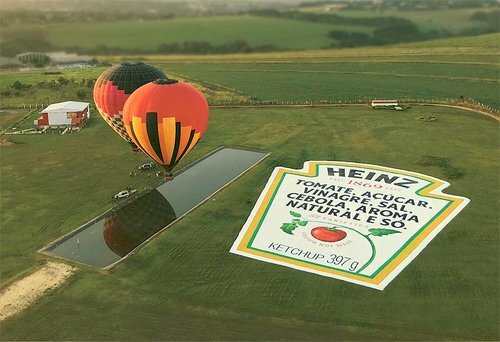 Heinz ketchup is made with only 6 natural ingredients, and we decided to tell that to consumers not through regular media. Not through the most innovative ways. We've used the most traditional media ever, that has been there for over 140 years. In Brazil, the food industry is obliged to specify the ingredients a product contains on the back of the packaging. The problem is that usually brands put everything in tiny letters to make it harder to read and thus hide artificial ingredients that lower end price. First, we used the product's label itself as media, changing the 140-year-old label and substituting it by its ingredients on huge letters. Then we transformed the label into a balloon outdoor so big that it could be the first outdoor captured by a satellite 650km far from Earth. The most legible label project had two phases. 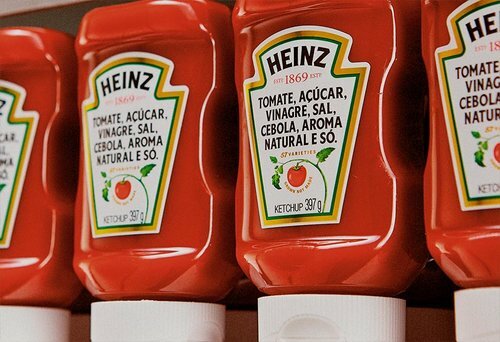 In the first one, we substituted the name of Heinz Ketchup, over 140 years old, by the six ingredients that make the ketchup. What used to be in tiny letters became visible on supermarket shelves and 6 million labels were printed.In the second phase, we went beyond. We increased the font size on the label in more than 432,000% so that everyone could see it. We placed the gigantic label on the National Skydiving Cener in Brazil to be seen by people in balloons or jumping with parachutes and even those in outer space. The label was photographed by Engesat satellite that’s more than 650km away from Earth and published in a website that explained the campaign.